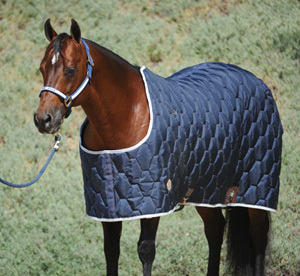 "The best fitting winter horse blankets for our customer's horses." At Avila's Pro Shop we understand that fit is very important for your show horse. Having fit show horses for 25 years we know what happens if the shoulders are too tight, the blanket is to short, or doesn't come down far enough on the sides. The 420 denier nylon outer shell on our blankets is great for year round comfort. The 800 grams of fiberfill adds plenty of protection and insulation. The 90 denier high thread count nylon lining continually polishes the hair. This is the best value for our customers.